At Tim Hortons, we believe in providing our guests with balanced choices and providing a hospitable and welcoming overall experience. Please see below for more information on our key initiatives. We understand the importance of balanced nutrition and are committed to offering our guests menu items that include a variety of nutritious and great tasting food and beverage choices. We believe that balance is an important part of living well, and that eating well and enjoying what you eat can and should go together. We provide a range of nutritious and delicious options to help you find balance, even when you are on the go. We strive to provide better-for-you options in each of our beverage and food categories. 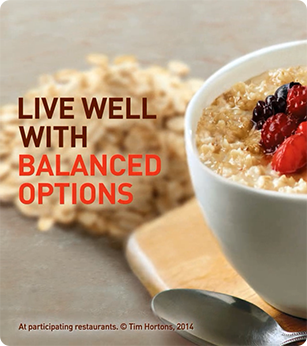 To find out more about how Tim Hortons products fit into a balanced lifestyle please click here. Looking for More Vegetables? In 2014 alone, we introduced more than 6.7 million servings of vegetables to our Canadian guests’ diets through our Harvest Vegetable and Cream of Broccoli Soup sales. Introduced in late 2013, our Turkey Sausage Breakfast Sandwich was promoted in 2014, providing guests with a lighter breakfast option (under 300 calories) when ordered with an Egg White Omelette on an English Muffin. Greek Yogurt with Mixed Berries and Almond Granola (Greek Yogurt Parfait) launched in the Canadian and U.S. markets. Made with fat-free Greek yogurt and available in Vanilla or Strawberry, the Parfait was a new balanced option snack for our guests with 13g of protein per serving*. *13g of protein per serving in Canada; 14g of protein per serving in the U.S.
New Mango Pineapple Fruit Smoothie launched in Canada and Orange Tangerine Fruit Smoothie launched in the U.S., each containing one full serving of fruit (½ cup serving recommended in Canadian and American dietary guidelines). Our Smoothie recipe was also updated to include low-fat Greek yogurt. We reformulated our core Muffin line-up by removing high fructose corn syrup, artificial flavours and artificial colours* (excluding fillings). Through reformulation we also further reduced the average sodium content of our Muffins – since 2010, we have reduced the average sodium content by 33%. We provide guests with a variety of fresh, wholesome and tasty foods and beverages all day long, through continuous product innovation. Our research and development team is continuously testing and developing products to meet the changing needs of our guests. Offering products that fit into a balanced lifestyle is something that is important to Tim Hortons. 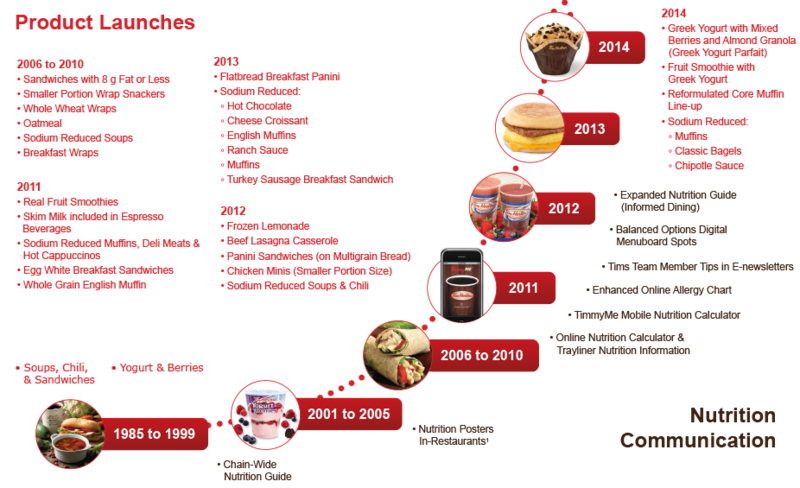 See below for a timeline of some of the innovative product launches and nutrition communication initiatives we have executed in Canada and the U.S.
1 This product/communication initiative is only available in some regions. Nutrition is an important focus for our Research and Development team. All products in development are reviewed for, and must meet our standards related to, allergens, trans fats and sodium. In addition to our own internal nutrition standards, we constantly monitor regulatory and nutrition issues to provide guests with improved food and beverage products, often before regulations are enacted. For example, we were in compliance with the voluntary guidelines suggested by the Canadian Trans Fat Task Force three years in advance of its June 2009 deadline. Sodium reduction is one of our key nutrition initiatives and we are committed to reducing sodium across our menu. In addition to further reducing the sodium content of our Muffins in 2014, we also worked to reduce the sodium in our Classic Bagels and Chipotle Sandwich/Wrap sauce. See below for our sodium reduction charts. We aim to provide guests with the information they need to make better-for-you lifestyle choices. Information is available through our website Nutrition Calculator, In-Restaurant Nutrition Guide, Tray Liners, Timmy Me mobile app, Toll-Free Guest Services Number, and we participate in the Informed Dining Program. We want our guests to have all the information they need to make educated choices when ordering. In 2014, we initiated our nutrition and wellness platform, titled Balanced Options, to help inform our guests about the wide range of balanced menu options available at our restaurants. While developing the program and our marketing and communication plan, we conducted thorough research to gain a clear understanding what our guests deem as important factors in maintaining a healthy lifestyle. Tims Team Member Tips in our e-newsletters, which include a monthly tip from one of our employees describing how they achieve a balanced lifestyle while on-the-go. Tim Hortons guests continue to be interested in nutrition and balanced menu options and want to make informed decisions about their choices. In 2014, we launched our participation in the Informed Dining program across Canada, a national voluntary program developed by the Province of British Columbia. The Informed Dining program provides the information Canadians are looking for at the point of ordering, in a manner that is accessible, visible and presented in a consistent way across the country. As part of our participation in the program, we expanded the information provided in our Nutrition Guide to include a greater number of products – all standard menu items, as well as some of our more popular guest favourites. We also enhanced our website and online Nutrition Calculator to provide our guests with easier access to the information they need to make educated choices when ordering. In 2014, we introduced in-restaurant communication that included a Calorie Aware section on our Canadian breakfast menuboards, which highlights menu items under 350 calories. Did You Know? 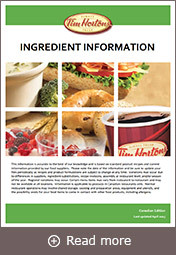 Ingredient Information is now available on all Tim Hortons Products. Click here! Our Nutrition Guide includes some of our most popular menu items and is required to be displayed in all of our Canadian and U.S. restaurants. Our nutrition information is also printed on the back of all of our tray liners. Nutrition messages on our carry-out packaging direct guests to our website or toll-free number. 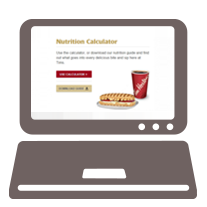 In 2014, we had more than 1.8 million unique visits to our Canadian online Nutrition Calculator, where guests have access to nutrition information for their favourite meal, beverage or treat. “Timmy Me” Mobile App Launched in 2011, this app allows guests to calculate nutrition information directly on their mobile device. Guests requring any additional information not found on our website can call our Guest Services line at 1 (888) 601-1616. Each Guest Services Representative is trained to answer general nutrition and allergy questions. The health and safety of our guests is of utmost importance to us. That is why we have comprehensive policies and training programs for Restaurant Owners and Team Members to learn about the importance of handling allergens. This information is also included in new product training guides, food safety manuals, Team Member handbooks, and in-restaurant allergy posters. We also aim to provide our guests with clear information about allergens. 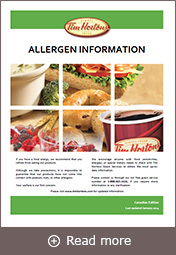 An allergen alert message is present on the “Welcome” signs displayed on our restaurant entrance doors and at our drive-thrus, as well as in our Nutrition Guide. Additionally, guests can download an Allergy Chart from our website. Global Standards: We use world class food safety systems such as Hazard Analysis and Critical Control Points (HACCP), and the British Retail Consortium (BRC) Global Standard in Manufacturing. Tim Hortons Food Safety Plan: Our Food Safety Plan is integrated into our product development and operational procedures, and we build in-house strength through corporate employees’ designations such as certified Public Health inspectors and Certified Professionals in Food Safety. Quality Assurance: Our Food Safety Standards Review and Food Safety Standards Guide maintain high food safety compliance across our restaurants and our supplier base. These programs are designed to meet or exceed food safety and health department standards, and regulatory law. Training and Certification: Food Safety certification by approved third party vendors is a standard operations expectation. All restaurant management teams and corporate employees who directly influence restaurant operations have up to date Food Safety certification. Our restaurant Food Safety Plan has been in place for many years and our cross-functional corporate teams work diligently every day so that food safety is integrated into the development of our products and operational procedures before they are introduced to the restaurants. Every new Restaurant Owner, Manager of Business Development, Manager of Operations Standards, Manager of Regional Training, and Restaurant Opening Team Member completes our food safety training and is certified before opening a restaurant. Since our Food Safety Plan is so well established across the chain, our focus is on re-certification which is required every five years or more frequently, depending on local legislation. We also support food safety by striving for optimal restaurant design and equipment selection to find the right tools to encourage safe behaviours. Our Food Safety Standards Review (FSSR) program and Food Safety Standards Guide allow us to maintain our high food safety standards across our restaurants. Our field operations team aims to perform two food safety standard reviews at each of our restaurants annually. Additionally, our corporate team reviews our FSSR program and the Food Safety Standards Guide each year. The FSSR program incorporates compliance with our internal food safety standards as well as health department standards and regulatory law. 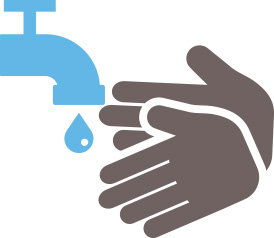 Areas of particular focus include food handler hygiene and practices such as hand washing, time and temperature control, receiving, storage, equipment sanitation and facilities maintenance, as well as ongoing food safety training of Team Members within our restaurants. In addition to our restaurants, we also work with our suppliers to ensure that they meet our high standards of food safety. In 2014, our Quality Assurance Auditors completed all of the scheduled onsite food safety and quality assurance audits for our North American supply base. Restaurant management and corporate employees who directly influence restaurant operations are required to maintain up-to-date food safety certifications. We use nationally recognized food safety education programs that are customized for our business and are delivered by established corporate food safety trainers. 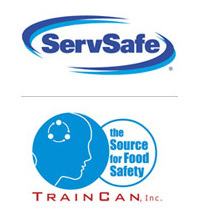 Our current food safety education classes include TrainCan’s (Advanced.fst and/or Basics) food safety course and the National Restaurant Association Educational Foundation’s (NRAEF’s) ServSafe® course for Canadian and American participants, respectively. Participants are required to pass an independently marked exam to meet certification requirements. Corporate food safety trainers are also required to meet the qualification criteria set forth by TrainCan or NRAEF in order to become registered instructors. We are proactive in our monitoring and communicating with health authorities across North America. If a standard is raised in one area, we typically adopt a higher, more proactive standard across the chain. We employ certified Public Health inspectors as part of our Quality Assurance team, who monitor and address significant concerns on inspection reports. Our food safety personnel provide guidance and education, and work with our operations field and restaurant management teams to immediately resolve all significant issues. At Tim Hortons, our guests are our number one priority. We strive to provide the ultimate guest experience that exceeds our guests’ expectations each and every time they visit our restaurants. Our commitment to the guest experience is a collaborative effort between our Restaurant Owners and our corporate offices. We recognize that our guests are looking for friendly, accurate and fast service, from all Tim Hortons team members both at the restaurant and corporate level. At the corporate level, Tim Hortons is dedicated to the development and execution of hospitality programs across the chain. An example of this would be the “Tim Cup Challenge,” which is a service competition that tests our Restaurant Owners’ and Team Members’ speed, order accuracy and friendliness. There is also a Guest Services team dedicated to responding to all our Guests who choose to provide feedback to the corporate office about our Brand or restaurant experience whether it is a concern, suggestion, inquiry or a compliment. There are a variety of ways that guests can share their restaurant experience with us. Our Restaurant Owners continue to work hard to earn guest loyalty every day by delivering fast, friendly service, and fresh quality products at great value. We encourage all of our guests to reach out to their local restaurant to provide feedback about their experience. We also encourage our guests to get in touch with us at our corporate offices by telephone, email, mail or through Facebook and Twitter. Guests also have the opportunity to complete an online survey at www.telltimhortons.com to share how satisfied they were with their restaurant experience, also available on mobile devices. We strive to respond to every guest request and inquiry in a fast, efficient and professional manner by providing our Guest Service Representatives with the right tools, support and training to quickly understand and address concerns. 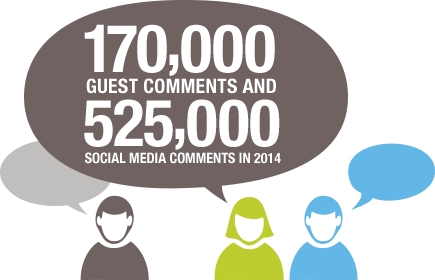 In 2014, we received more than 170,000 guest comments by email, phone, mail or fax along with an additional 525,000 comments coming through our social media channels. Through the traditional channels, 85% are resolved with our guests during their initial interaction. Feedback from our guests focuses on topics such as nutritional inquiries, product ideas and personal experiences. Together with our Restaurant Owners, we challenge ourselves every day to create the ultimate guest experience that makes the difference between satisfied guests and delighted and loyal guests who continue to return to our restaurants. If you would like to provide us with your feedback, please contact us using the options available here. I just wanted to inform you that I really respect the impact your company has made in the community, from local to international. You truly make a difference, whether it be a charitable service, such as community projects and the children's foundation, to just allowing us to share a cup of coffee or a box of Timbits with our friends and family. A company such as yours that excels in your field but gives back to the community is something to respect. I recently purchased an Electric Car and love that you have a charger at some of your locations and hope that you are willing to further roll out this amenity at more restaurants. It would be very unlikely that I would be stopping at this location at least 4 times a week if this service was not here. It is good to see a corporation taking a lead on such an important environmental issue. I would just like to say thank you for the Turkey Sausage Breakfast Sandwich. I eat pretty healthy so I try to avoid all breakfast sandwiches as much as possible. However after seeing the nutritional information on your website I decided to try it and it was great! When I need a breakfast sandwich that is the one I will order. So thank you for a healthier version! Way to go on the mobile site's nutrition guide. My son is a type 1 diabetic so we always have to look for carb totals at restaurants. This was very quick and easy to use. Thank you. I would like to say how pleased I am that you are supporting the food bank by supplying bags. I will use mine and I am sure you will get so much support. Please do this again I think you are doing a great job for the people in need in our community. Thank you so much. Our very own @TimHortons is socially responsible. They care about children's health by being the number 1 sponsor for children's sports. Thank you to all of the Fort Erie, Port Colborne and Crystal Beach Tim Hortons locations for selling delicious Smile Cookies for the Boys and Girls Club of Niagara! This year Tim Hortons raised $12,320 for the BGCN children and youth - amazing!!! @TimHortons Thank you. Your customer service and social media presence is great.